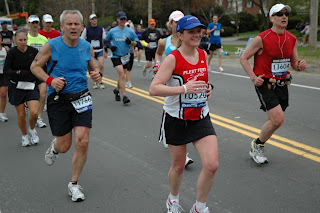 Boston 2010 was my tenth marathon. That is pretty darn cool, no? No PR, no course record, in fact, my time was far from stellar. However, the experience ended up being nothing short of amazing despite some mental hurdles midrace. In fact, the race itself was very similar to my day on Saturday. It was a long, tough day with lots of obstacles, but ended great. As most of you know, I had been continually conflicted for my goals for Boston. Initially, I said I was going to scale way back on training and just enjoy the ride. But then I hired a coach. 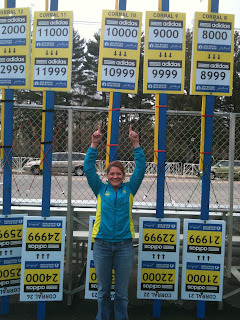 I guess in the end, I combined the 2 by lightening the training load, yet training hard, and enjoying Boston. My training was difficult and I was slow. My races were sub-par. However, the last few weeks, I really started getting the snap back into my legs and feeling some speed. I was hopeful, optimistic and truly excited. Race morning was no different. Everything seamlessly came together. I felt rested and strong. I thought I would be capable of running sub-3:30. I got to Athlete's Village and within minutes ran into my friends from Madison. It was nice to hang out with them before the race. I walked to the starting line and felt excitement, pride and gratitude. The weather was perfect and there was excitement in the air. There was also a navy fly-over, which was amazing. The first couple of miles were great. There is a big drop in the first mile, but the crowded field kept me in check. I felt as though I was holding back nicely. My breathing was comfortable and I felt great. 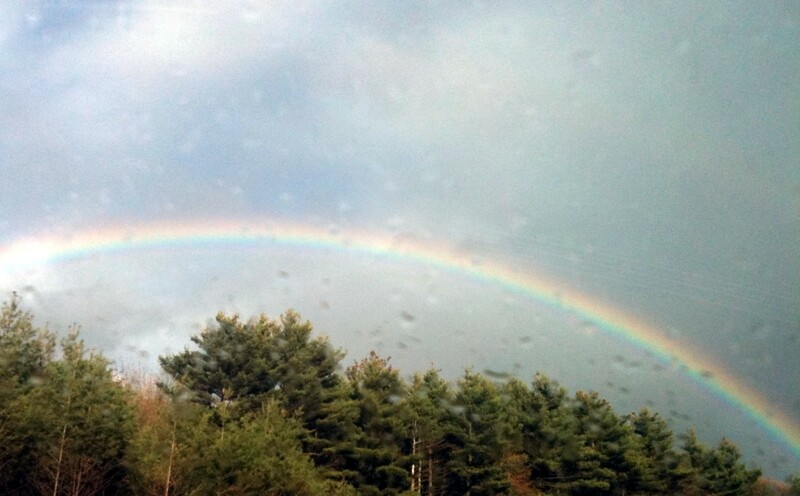 This continued for the first several miles. I ran on the edges of the course and high-fived every kid that outstreched their hand to me. I was smiling and having a lot of fun. At the 10K point, I saw Maria and it was wonderful to get a high-5 from a familiar, friendly face. At approximately 7.5, I saw my family screaming at me. I jumped off the course and gave my boys big hugs and kisses. I was so happy to see them and was so thrilled they were there cheering me on. Shortly after this, however, I was starting to feel really parched. I don't know why. I had carried a water bottle the first 6 miles and was continually sipping from it. I had also been hydrating the days before. Perhaps it was the 14 hour travel day on Saturday? I will never know. Regardless, while my breathing felt fine, I felt incredibly thirsty. I continued pushing on, but it was starting to feel harder. So, I continued to gauge my pace by feel and just go with it. I got to Wellesley and was surprised I did not hear the scream tunnel in advance. In 2007, I recall hearing the girls .5 to .75 miles before I got there. Not today. But once in the scream tunnel, I completely lost my breath it was so loud in there. It was almost as though I had a lump in my throat. It was uncomfortable, but kind of cool in its own right. Then came the tough part. By mile 15, I knew today was not going to be my day for a fast race. Nor was I likely to be within the range I was really hoping for (3:25-3:35). And that revelation was a very difficult point for me. A big part of me wanted to drop out. I have never felt like that in a race before, but I did on Monday. Why? 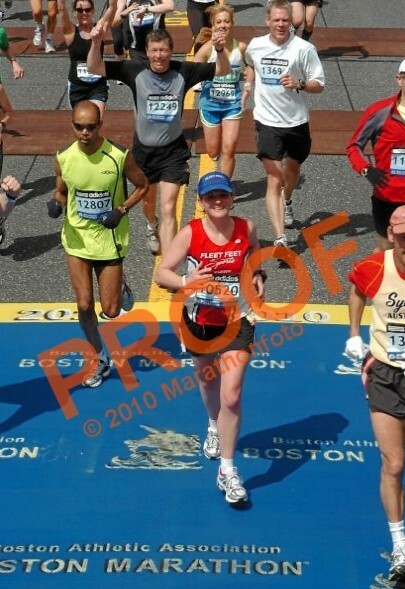 I didn't have the fire in my belly to finish Boston - been there, done that. And I really didn't feel like killing myself for a crappy time. 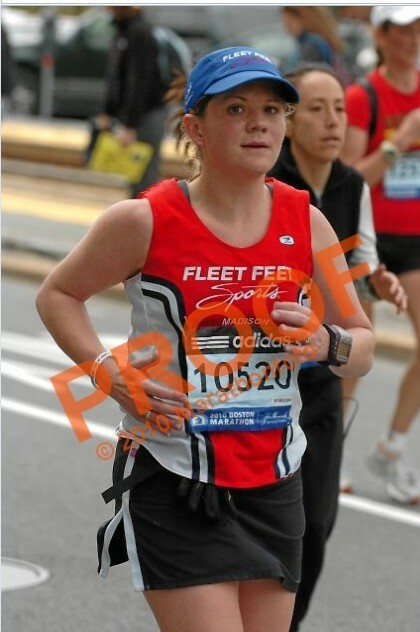 I think if I had seen my family during miles 15-17, I would have seriously considered DNF-ing. Fortunately, I didn't see them. And during these miles, I decided to start walking though water stops, taking in lots of fluids and walking for approx. 1 minute. I am so glad I did. By miles 19-20, I started feeling a lot better. I continued to take in the crowd and high-5 lots of smiling kids. I thought of my Girls on the Run girls and how I could never go home and tell them I gave up. 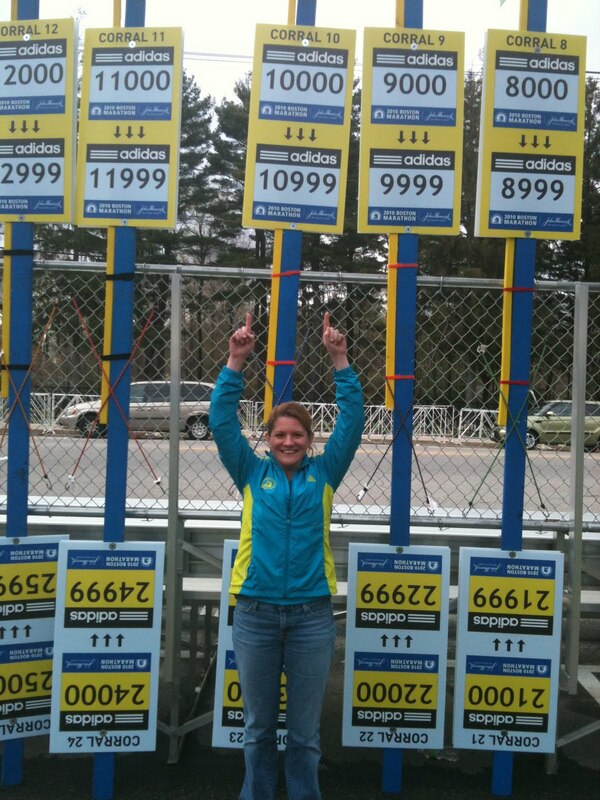 I thought of my family and running peeps and how I could never say I DNF-ed. That is just not what I am about. At mile 23ish, I was cruising through a water stop and a man came up along side of me and we started chatting. He asked me where I was from and I said "Madison, WI, where are you from?" Him: "Me too, Cottage Grove." No way. Cottage Grove is a tiny little town (where I also live). How hilarious. He said he was there running with his son. I started running again and we parted ways. (Note: after the race, I looked up how many people from my small town had run Boston. There were 3 - me, him and his son. What are the chances?!?!). I started picking up the pace at this time and walking less through the aid stations. I was having fun and I wanted to finish strong. My new goal was not to make this marathon my slowest, so I was determined to finish faster than 3:53. The last couple of miles were filled with spectators and very exciting. I also passed several U.S. Army soldiers in full gear. I thanked them all. I continued to increase my pace ever so slightly. 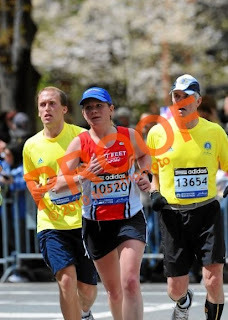 Just before the turn onto Boylston, I kicked it up and my L calf started to cramp REALLY hard. Again, that has never happened to me before in a race. I thought - oh no! Not now. Fortunately, it was short lived and I was able to "bolt" (hey, everything is relative, people) down Boylston to the finish. Time was 3:50:27 and I finished with a smile. My family met me in the family meeting area and it was so wonderful to have them there. I wanted to know how Ryan Hall and Meb did, and was thrilled to hear that R.C. broke the course record, Hall broke the American record, and that the women's race was super close. Tuesday we went to the Science Museum and visited with family. All in all it was a wonderful trip! The boys are still gushing about how much they loved Boston. And on Thursday evening, I stopped in to see my girls at Girls on the Run. (I couldn't come the whole time for other obligations, but I wanted to stop in and see them). They squealed with delight when I got there and I was immediately inundated with big hugs and questions about Boston. I gave them each a GOTR sticker I had gotten for them at the Expo and they were so thrilled. Wow. Their reaction alone made me so happy I did not let my ego prevent me from finishing the most famous marathon in the world. The best news is that since I scaled it back in the second half, I am not nearly as beat up as I usually am post-marathon. I have a couple toenail causalties, but that should clear up soon. I initially said no way to another marathon this summer. But of course, that has quickly changed. Next up: Madison half on May 30, 2010; Grandma's Marathon on June 19, 2010. This here "...and I finished with a smile." is the most important part! Great job Mindi, way to stick with it and see the race through. You are a superstar!! Recover well. great job Mindi. Bring on no. 11!! Way to stick with it. You would have been kicking yourself for sure if you had stopped. It sounds like it was such a great experience - and how wonderful that your boys were all there to share it with you! Grandmas? Wow that's getting back in the saddle. I had those dnf thoughts at boston too. It was my 11th. I'm well off my time. What am I doing? Of course, like you, I'm glad I finished. Rest up. Well as much as you can when you have a marathon in, what, six weeks? Mindi, I just the way you went from wanting to stop to not only continuing but stepping it up and finishing strong. That is the heart of a champion. Great job!